These are my very own recipe. I mean, I figured them out by starting with the recipe for Toll House chocolate chip cookies and a couple of oatmeal cookie recipes, and I found some common ground, and then I made a few batches and tweaked things until I got to this. I think the cinnamon is particularly inspired. Cream the butter and sugars together until fluffy, then add the vanilla and beat again. Add the eggs one at a time, beating after each addition. Whisk together the flour, soda, salt, and cinnamon in a separate bowl, then add it to the wet stuff, stirring until just combined. Fold in the oats and chocolate chips (or, on a bad day, restart the mixer on slow just until it looks mixed up). Scoop the dough onto ungreased cookie trays (although I sometimes use parchment paper, which is lovely) in 1-1/2" to 2" balls. Bake at 375 degrees until the cookies are starting to turn golden and no longer look mushy (about 12 minutes - ymmv). Let sit on the tray for a minute or so before transferring to the cooling rack. Makes about 4 dozen good-sized cookies. There you have it. I made these this past weekend. They fit my desire to eat in a more healthful manner, which does not mean that we eschew sweets, but that I have to make foods from scratch, more or less. 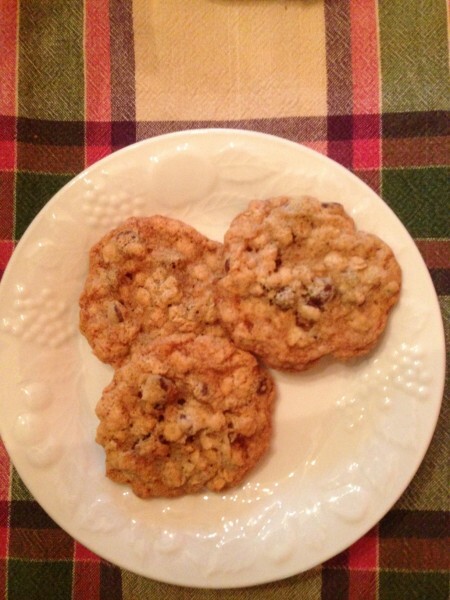 I hope you like my recipe for Oatmeal Chocolate Chip Cookies. The cookies are really tasty, but they also have the magical ability to enhance the flavor of your tea or coffee. Also great with milk, of course. Or alone. They tend not to last long around here. So I noticed when we were at the Egyptian restaurant. I didn't quite like the texture when I tried that, so my recipe is a bit different. Ooh, that sounds yummy! Thank you for sharing! You are welcome - and that is one cute icon! !